The pleasure of being a tea pack rat is that one routinely finds various manner of forgotten packets that can cheer up a rainy day. Another of China's storied teas attributed to that tea active monk Da Fang, Ding Gu Da Fang is wok fried and shaped similar to longjing. At first glance, I mistook it for longjing when I peered at the unbrewed leaves. The tint is a bit more golden indicating longer roast times. A few slightly burnt minuscule spots on the brewed unfurled leaves confirm work processing. And the taste is also not too distant from longjing except more buttery, more artichoke. The noted floral aromatics for this tea are somewhat mute in this specimen although they may have fled by now. This Anhui green's peak taste was probably last year at the year of processing but I'm glad I at least caught the window within 12 months and not a decade later. When one's majority stake in tea is in aged goods, it's easy for freshies to get lost. No knowing if these leaves are indeed from Huangshan or an reasonable imposter from nearby. 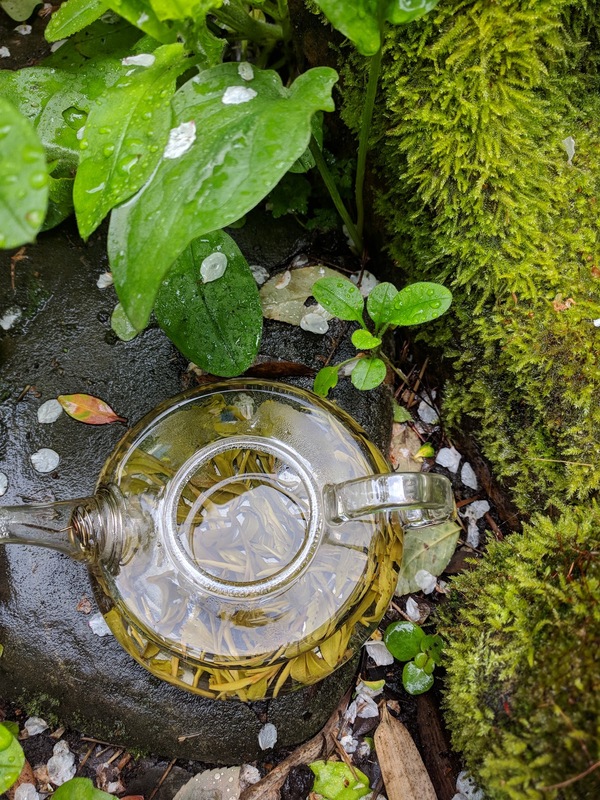 "The color of Songluo tea was compared to pear blossom and it's fragrance to bean stamens; "drinking it was said to be like munching snowflakes". I've munched on plenty of snowflakes, sniffed plenty of bean stamens and gazed upon pear blossoms in my mini-orchard but never all at the same time. This trifecta of odd sensory delights will have to wait until next year due to my purchase ban. 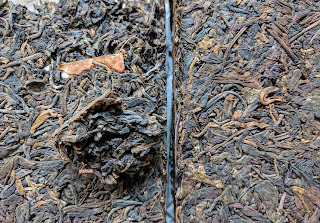 Aging puerh has trained me well, drained me of urgency. There is pleasure in delaying and reserve novelty as there are plenty of decades left in me and only so many tea types in the world. The rains in the Bay Area have now stopped although the hills are muddy and one has to trod carefully. Gaining the vistas of SF require strong iron haunches. 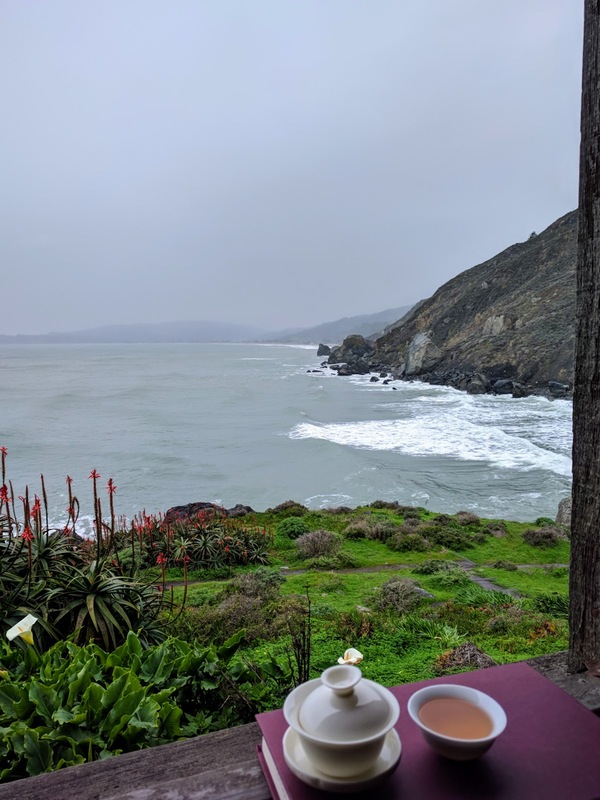 Northern California is beset with a rainy week thanks to the "Pineapple Express". 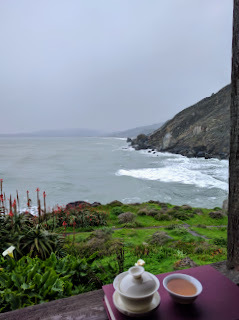 In previous years, wet winter days such as this meant cracking open tea boxes for a day of brewing. 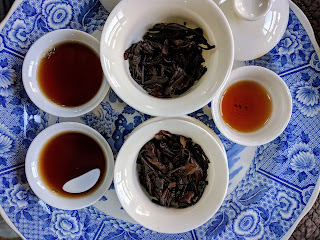 It has been too long I have cracked open any beengs and choose a few to see how they are getting along- a '05 Changtai Lao Chen Bulang, '06 Changtai Nannuo, and a '05 Yiwu Zheng Shan Song Pin Xing. I'm looking for a daily drinker to share at work. We have had a green tea shortage at the office and I've been for dawdling for months making a selection. The two Changtai's are pretty decent- reasonably bitter, dense and sweet. I am briefly stoked that these beengs have turned a corner into drinkability. The Yiwu is still mild and inoffensive as ever- mildly bitter and mildly sweet. I'll probably bring the tamer Yiwu in since bitterness of the Changtai would be considered off the charts for regular green tea drinkers. The "reasonably bitter" designation is for fellow sheng drinkers who are used to a punch in the mouth. I wouldn't bring such brute teas into a place of work. Or wouldn't I? 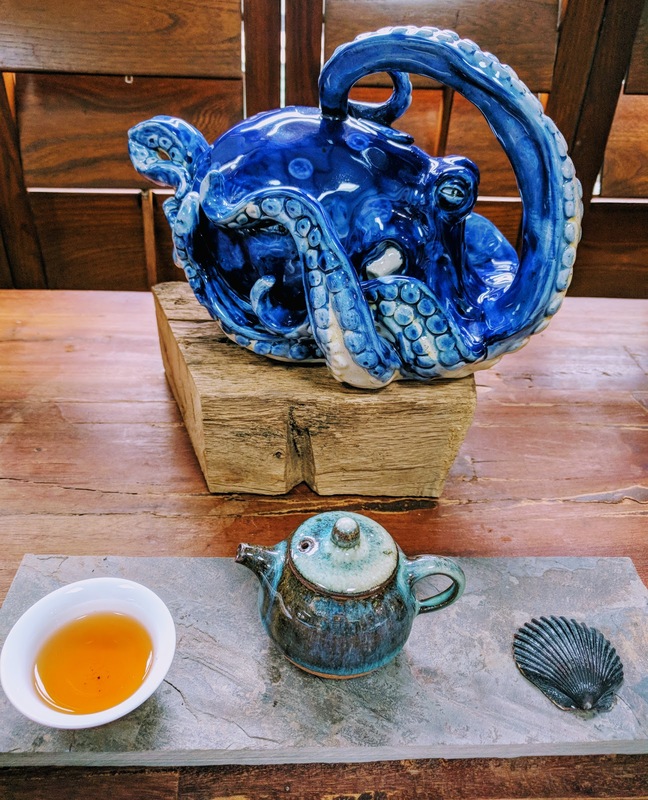 The handsome octopus teapot was a Xmas gift from my husband. How does it brew? Even though it's a mass produced pot, it has so much character that it need not rely on it's brewing abilities to merit a permanent spot on my dining table. 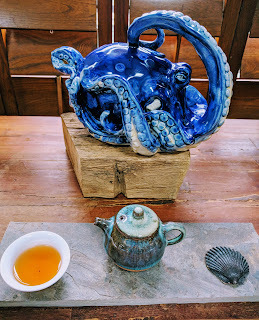 It's too much of an inconvenient brew and the size I prefer for solo sessions is this tiny friend from Petr's Pots and Tea Club.